Apple Watch Series 2 is here (read our Apple Watch Series 2 review) but we've been waiting for the Nike+ Edition. But wait no more dear reader, for it will be available from this Friday 28 October. Apple Watch Nike+ will be available in two different aluminium case sizes, 38 mm and 42 mm and pairs with four exclusive Nike Sport Band colour combinations including Black/Volt, Black/Cool Grey, Flat Silver/White and Flat Silver/Volt. 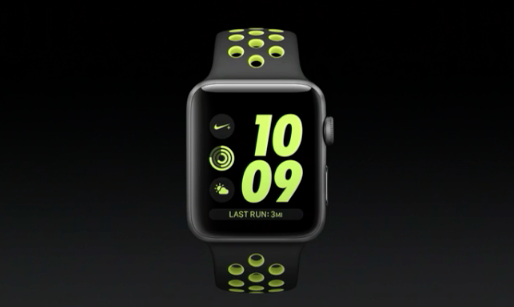 Apple Watch Nike+ will be available in 38 mm at £369 and in 42 mm at £399 from all the usual retailers. Naturally all versions of Apple Watch Series 2 have watchOS 3 - check out our guide to all the new watchOS 3 features. Apple Watch Series 2's biggest boon is that it has GPS for fitness tracking plus a new new brighter display and 50m of splashy water resistance. This is a game-changer (for us) as we hate taking ours off in the shower. Apple has included the GPS chip so you can run without your iPhone should you wish to. A new CPU has also been added, which delivers up to two-times-greater graphics performance. The second-generation display boasts 1000nits of brightness so it can be more easily read in in direct sunlight.